This front trackbar will allow you to easily center your axle under your Jeep. One turn of the adjuster shifts the axle by approximately 1/16 inch at a time so you may fine tune your axle center very precisely. A perfectly centered axle is important to have for proper steering and "Quick Disconnect" operation. The body of our trackbar is made from 1.25" x .156 DOM tubing, bent to proper angles for various lifts. A rebuildable "johnny joint" is used at the frame end, which also happens to be greasable. A tapered sleeve is then provided to fill the remaining taper. At the axle end you will find a zinc plated adjuster using the factory OEM style rubber bushing to reduce bushing "noise" transfer. The body is then flat black powder coated for corrosion protection. 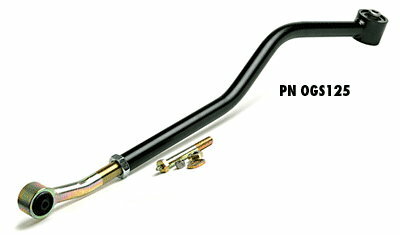 Choose from the OGS125 or OGS126 trackbar depending on your suspension height. Available for 0"-6" of lift. Please specify lift height when ordering.